Screencap from 5 News via New York Daily News. 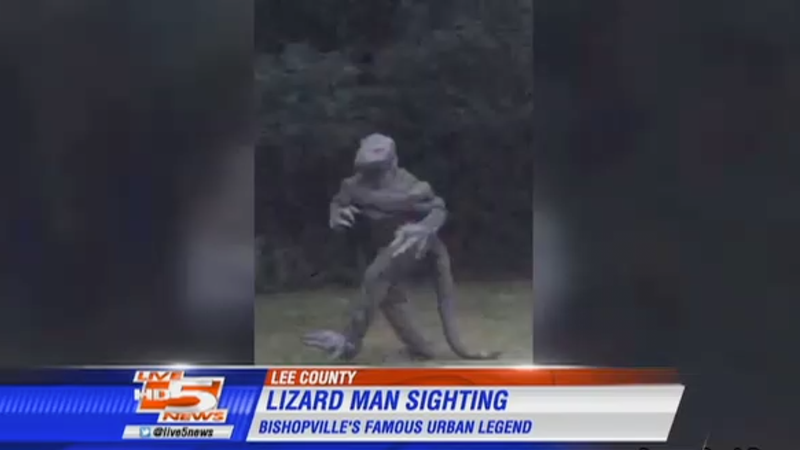 As part of eclipse preparations all along the path of the upcoming solar eclipse, the South Carolina Emergency Management Division recently reminded citizens to be ever vigilant to the possibility of sightings of the Lizard Man, in the event the Lizard Man or Men are more active during cosmic events such as planetary alignments. And here is a local news report, providing more detailed information. “Obviously this was done very tongue-in-cheek with state emergency management today,” intoned the WLTX 19 co-anchor. “This coming on the heels of that ridiculous Bigfoot sighting in North Carolina yesterday.” And indeed, WECT out of North Carolina recently drew attention to a map plotting accounts of Sasquatch sightings along the eclipse path. Where’s it all going? Are the Lizard Men and the Bigfeet and the creepy clowns that all suddenly went missing right after our horrible November election converging on somewhere within the path of the eclipse for a purpose which we cannot yet identify? Only time will tell!!!!! Not that anything they come up with could be any more alarming than our current reality.